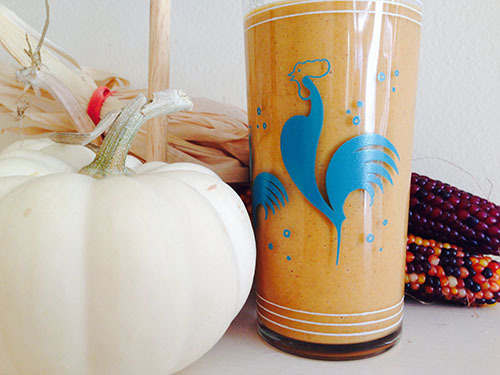 Maple Spice Pumpkin Pie Smoothie - Are We Zen Yet? I really wanted to do right by this recipe. Anyone who has known me long enough knows that I love pumpkin pie flavored (pretty much) anything. Especially pumpkin pie ice cream, which I can no longer eat because at some point in my adult life when I ate dairy it started to feel like someone was stabbing me in the stomach. (Et tu stomachus?) There was a smoothie place I frequented in my early 30’s and every year around this time they’d bust out a pumpkin pie flavored smoothie. You better believe I bought the big ol’ barrel-hug-your-arms-around-it size and drank that till I peed orange. My mission with this pumpkin pie smoothie was to get it to taste like a milkshake. This took a little work over the past week, but I think I achieved success this morning. I figured I’d nailed it when I realized I was halfway done with the smoothie in less than 30 seconds. I decided to put the smoothie in the refrigerator so I wouldn’t drink it so fast, but then I just kept doing a walk of shame back and forth to the refrigerator, opening and closing the door over and over again for three minutes until there was nary a drop of pumpkin pie smoothie to be had. This is a sweet smoothie, but it’s Halloween and dammit, we deserve a sweet treat — especially if it’s going to be healthy. Now, if you’re shuddering at the ingredients listed because you’re calculating it’s going to be about a thousand calories — and you’d be right — keep in mind these are nutrient dense ingredients with high quality fats. My body was so satisfied after this smoothie that I didn’t have a pang of hunger for six hours. Still not sold? Share it with someone then, not that I think you’ll be able to once you try it. I had Kidbe in the baby carrier while making this and I shared some with her. Both of us were sporting some serious orange moustaches. The only minor complaint about this for me is that it wasn’t cold/frosty enough. If you know how to get the texture to be more like an icy milkshake, please post in the comments below! Put all ingredients except the ice into your high speed blender. Once blended, add in the ice and blend again until the ice is completely broken down. I’m also a lover of all things pumpkin. I will make this soon. Maybe today. To make it more frozen….blend once, chill I’m freezer for 10-15 min, blend again. That’s how I make sorbet in my Vitamix. Maybe it will work here too. Ohh, that’s a great suggestion – thank you! And let me know what you think of the smoothie too!